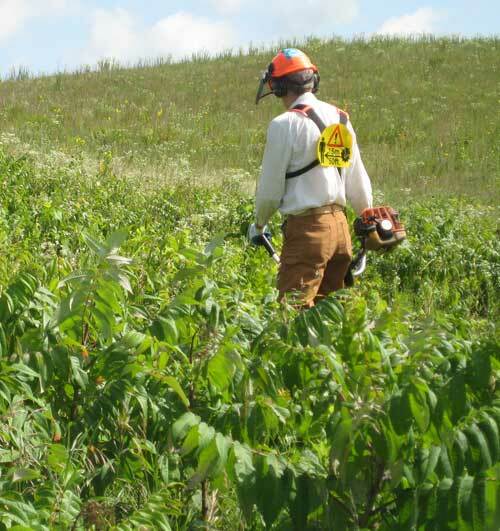 Follow this link for new information on sumac eradication! There are several species of sumac in Eastern North America, but they all have similar properties. The discussion here deals with smooth sumac (Rhus glabra), one of the most common and most invasive. Although sumac is native, it is highly invasive. In Curtis' studies for the Vegetation of Wisconsin, sumac had a fidelity number of 10-12, making it one of the most versatile species in the state. Allowed to proceed unchecked, it is able to take over a prairie or savanna natural area. 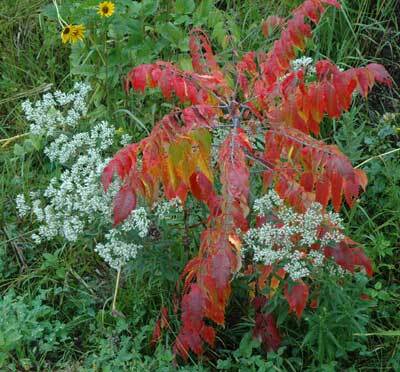 If the character of a natural area is to maintained, control of sumac is essential. Sumac is a woody plant that has the potential for forming large clones. The shade under these clones can be enough to suppress virtually all native vegetation. It spreads by rhizomes which form a complex underground root system. Among this root system are buds capable of forming shoots. The distance of new shoots from an initial plant is variable, but new shoots can be as close as 6 inches and as distant as 3-10 feet. During the first year of life from a seed, only a single stem is produced, but in the second and subsequent years, progressively more stems are produced. Thus, the best time to control sumac is before the clone has become established, when there are individual plants separated from each other. The shape of a clone is approximately spherical. As a clone grows outward, stems formed in previous years also continue to grow vertically. The tallest stems are at the center of the clone, with small stems at the periperies. An individual stem may be three to more feet long, with scattered leaf nodes, each of which has a single bud that can potentially grow and form a branch. Fill-in growth, when stems within the clone die for some reason and then are replaced with root suckers. Root suckering does not seem to occur inside the clone unless some damage has taken place, probably because of apical dominance from the dense number of existing stems. In addition to normal growth, there are the growth responses that occur because of mowing, fire, or herbicide treatment. Mowing results in loss of apical dominance, resulting in resprouting from existing buds on cut stems. Herbicide treatment of a stem kills all buds, both those above-ground and those below-ground, so that no resprouts occur by that stem. However, removal of apical dominance (or whatever it is called in this situation) results in root suckering. Resprouting at the base of existing stems due to top-killing by fire or other means. In addition to the above ways of adding NEW SHOOTS, existing shoots can also grow in several ways. Length, by opening of a new bud and extension of its stem. It is possible to see the various years along the stem. Diameter, of the older parts of a stem. Can count growth rings. Large sumac clone invading a prairie remnant. The area had been burned biennially for the past dozen years. A sumac rhizome. According to published research, rhizomes of Rhus glabra can extend as long as 11 feet! 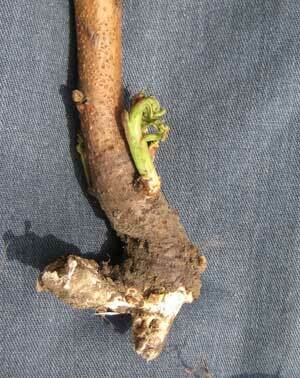 Each rhizome can send up numerous shoots. A living sprout developing from a bud at the base of a sumac stem. Although more than one bud can develop from a single root collar, generally only one or two shoots develop. A sumac clone that was burned the previous spring. The tall brown sticks are stems from the previous year that were all top-killed, but numerous sprouts from underground buds have developed. 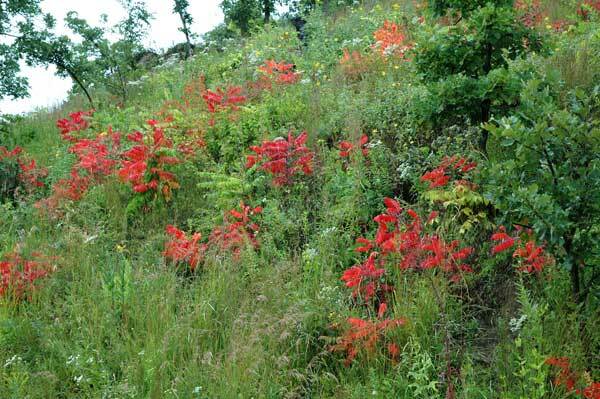 Even annual fires do not eradicate sumac. 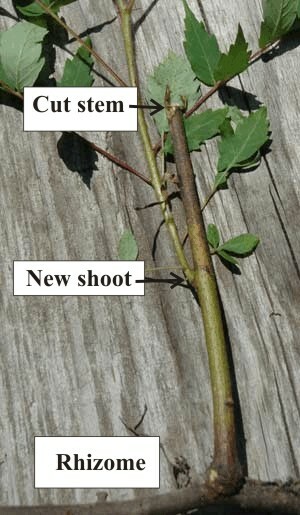 If a sumac stem is cut, a new shoot is initiated, usually at the first bud below the cut (see photo below). If the stem is cut at the very base, below the lowest stem bud, then a dormant bud existing just above the rhizome will generally grow and form a shoot. Mowing is often recommended as a method for controlling sumac. The recommended procedure is to cut the clone twice in the same summer, once in mid-summer and again in late summer. The rationale here is that by cutting twice, the photosynthetic reserves in the root system will be exhausted and the clone will die. However, double mowing does not eradicate the clone, although it will set it back. There are still numerous viable buds capable of initiating growth. A sumac stem that had been cut a month ago, showing a new shoot developed at the first bud below the cut stem. If the stem had been cut at the base, a new shoot would form from a dormant bud existing just above the rhizome. 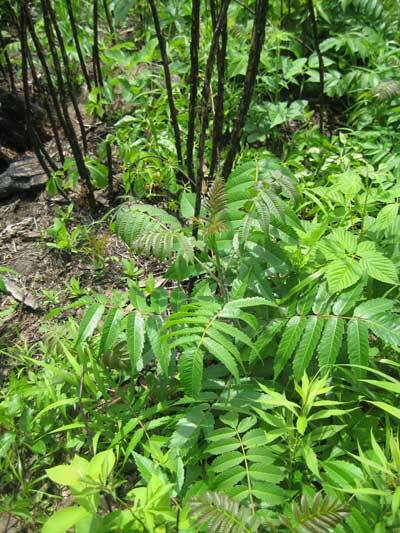 Sumac responds readily to treatment with triclopyr (Tradename Garlon), a broad-leaf specific herbicide that is very effective against woody plants. There are three methods of herbicide application: 1) foliar spray with a 2-3% aqueous solution of Garlon 3A; 2) treatment of cut stems with more concentrated Garlon 3A or Garlon 4 (15-20%); 3) basal bark treatment of uncut stems with Garlon 4 (15-20%) in oil. Garlon 3A is the water-soluble product and Garlon 4 is the oil-soluble version. For large infestations, especially those which do not have good populations of native species, the foliar method may be best, but for eradication of sumac from high-quality natural areas, use of Garlon 4 in oil is recommended, because its application can be made very local and specific to the sumac stem. For small infestations or single plants, basal bark treatment of uncut stems is preferred. For large infestations, where it is desirable to remove the biomass from the site, cutting with a brush cutter followed by basal bark treatment is the best. 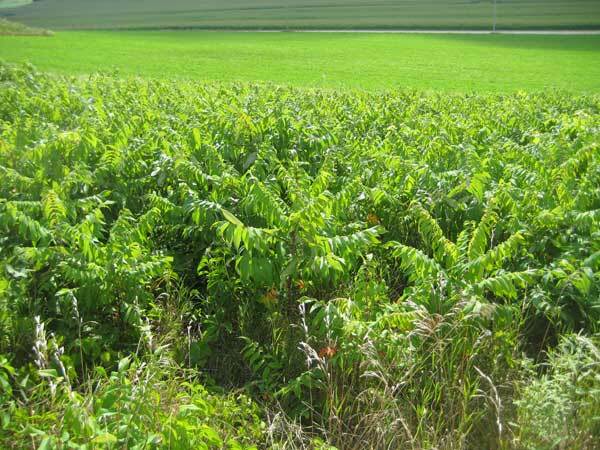 However, to eradicate a sumac clone a single treatment with herbicide is not enough. Killing the above-ground shoots stimulates root sucker formation, and these new shoots must be killed if the clone is to be eradicated. It is necessary to canvas the treated clone within a few weeks, locate these new shoots, and spray them with a foliar spray (Garlon 3A). Repeat again in a few more weeks, and again in a few more weeks. Then return the following year (late spring or early summer) and spray any new shoots. Repeat again in the third year. Each time there should be fewer root suckers, and by the third year there should be none. All stems in the clone should be treated. This procedure is very effective, and if sumac is present as individual plants or small groups, a single treatment should be sufficient. For large clones, root suckers will form, either the same year or the next, and must be dealt with by herbicide. 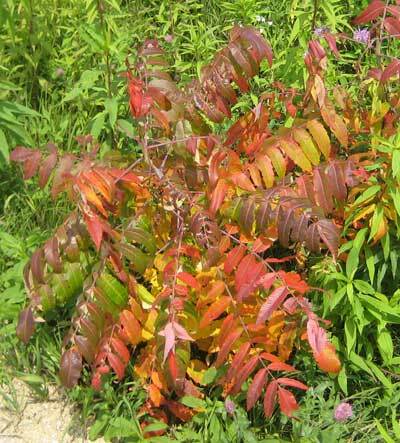 Within a week of basal bark treatment, the green sumac leaves have turned red. This fast response makes it possible to ensure that all of the stems have been treated. Sumac plants that had been treated in a prairie remnant. By the second week after basal bark treatment, the leaves are starting to wilt. 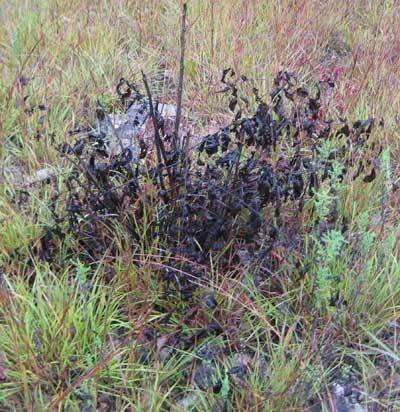 Within two to three weeks after treatment the sumac plant is dead. Demonstration that the herbicide treatment is restricted to the sumac plant. Two Garlon-sensitive plants, tall boneset and black-eyed susan, are growing unharmed in and around the treated sumac plant. See the Garlon-treatment method shown above. When cutting sumac, the brush cutter blade used should be a saw blade with sharp teeth. This provides a straighter cut so that the herbicide spreads better over the surface. If a brush cutter is not available, or for small clones, hand-operated loppers can be used. Procedure for dealing with large sumac clones. A motorized brush cutter is used to cut the stems close to the ground. (The cut stems are removed from the site so that herbicide treatment can be handled more efficiently.) Both the remaining exposed stem (basal bark) and the cut surface are treated with Garlon 4 in oil. It is essential that all cut stems be treated. It is also necessary to return to the clone later the same season as well as the following year to treat any new stems that have arisen from underground rhizomes. If these shoots are treated when they are still small, a foliar spray with 4% Garlon 3A in water can be used. If Garlon 4 is not available, Garlon 3A can be used on cut stems. This misses the basal bark option, but as long as a clean cut stem is created, the water-soluble herbicide should penetrate. 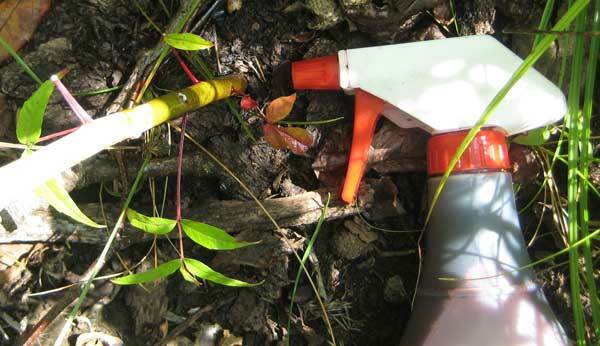 For small infestations, hand loppers can be used, using basal bark treatment with Garlon 4. Mid-summer cutting can be followed with foliar spraying with Garlon 3A (4%) of the small resprouts in late summer. Because the resprouts are small and have very little stem surface, basal bark treatment cannot be done. If the foliar spray option is selected, it is essential that all of the cut stems from the mid-summer cutting be removed, so that the new shoots can be easily found. With care, a backpack sprayer can be used for the herbicide application, although a hand-operated spray bottle also works and is easier to keep from damaging "good" plants. Small sumac patches (of a few stems) will usually be eradicated by a single basal bark application, but multi-stem clones will require two or or more years for eradication. This is because herbicide does not reach all the underground root system, and root suckering will occur. The best procedure to deal with root suckers is foliar spray with Garlon 3A (2-3% concentration in water). The best procedure is to mark the clones. Root suckers generally appear by early June, but not all suckers will appear above ground at the same time. Return several times during the second summer and spray all shoots. Careful treatment the second summer may be all that is required for eradication, but it is advisable to return a third year. With persistence, sumac clones can be completely eradicated. 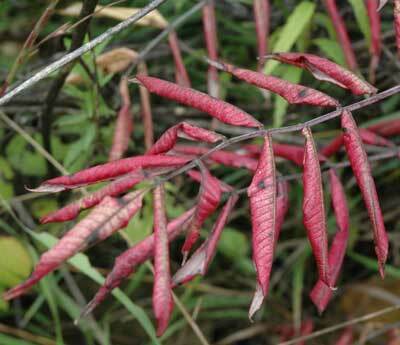 See this link for a discussion of sumac control work done at Pleasant Valley Conservancy.